If I trigger a build it all works correctly, however if the Scheduler triggers a build it does not seem to get all the files from VSS. I have clean checkout directory turned on, so I am not sure how it determines the patch for the VSS root. Does anyone have any suggestions on how I can get it to always get all files, and create a new patch each time? I have put the start of two build logs below, as you can see the first one has the correct 249mb, whereas the second only transfers 2MB. The files it doesn't get from VSS seem sporadic and not in relation to what has changed. What version of TeamCity do you use? 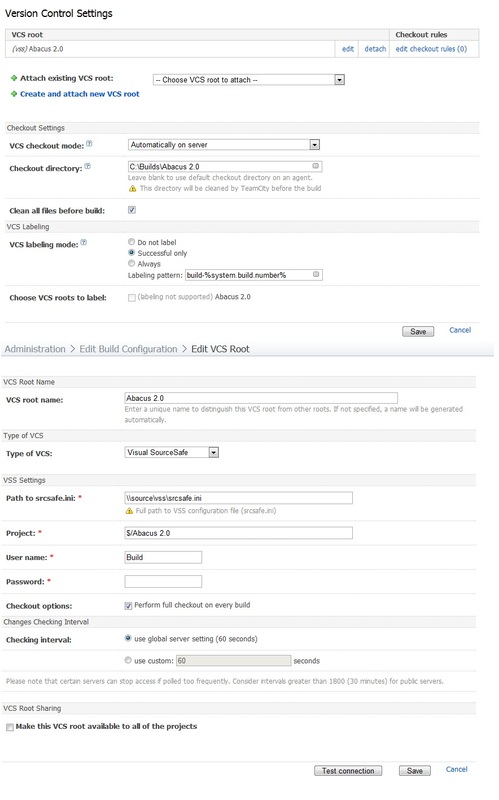 Could you please attach a screenshot of your VCS configuration settings. I am currently using 5.0.3 (build 10821). I have attached a screenshot with my configuration settings. Is this issue still actual and reproducible? Were there any changes in build configuration settings between two this triggers execution? What size are sources in this project? I use Visual Source Safe and if TC settings use not clear all data it not get check in files. Please check the quiet period in VCS trigger. Try settings something like 5minutes or so. Unfortunately, VSS does not provide atomic chekins, thus it could turns out that TeamCity is trying to checkout sources at the moment of a commit. Do you see changes in TeamCity that does not updated on the build agent? Could you share a database (or sample database) for us to analyze? Nikolay, do you have clean-checkout checkbox checked in VCS root settings? and all my changes I see changes in TeamCity. But VSS do not update Checkout directory. I see. Could you please share the database or provide VSS history or a history of your actions for me to reproduce the issue. What is the version of VSS you (and all your team mates) use? If I describe a sequence of actions that will be enough?